Aside from mechanicals, every electronic cigarette is dependent on electronics. They include electrical switches, lights and most are designed to maintain a consistent voltage for safe and smooth operation. Advanced personal vaporizers (AVPs) will allow users to vary the voltage (VV), or even the wattage (VW), while the most complicated setups can adjust the voltage and wattage settings automatically based upon the resistance of the atomizer. Switches, lights and display screens are common on APVs and the circuitry can get quite complex, depending on the device. Because of the integrated electronics and built-in safety features, APVs work great with almost any type of standard cartomizer or clearomizer, and when used appropriately, the risk of a catastrophic event is virtually nil. On the downside, dependency on electronics means that APVs are more likely to fail. Even if the batteries are in full working order, if the electronics go kaput, you're likely to need a full replacement. Sometimes just dropping an APV can cause it to break, and depending on the setup, it can be a costly mistake. Mechanical e-cigarette mods, or "mech mods," are for dedicated enthusiasts looking to eliminate the complex circuitry and get down to the basics. 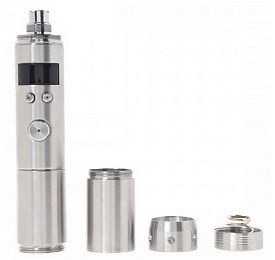 Although mech mods still use electricity, mechanical refers to the inner workings of the device, which will lack any electrical components, such as voltage regulators, switches, lights or screens. 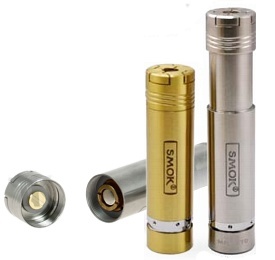 Voltage output from a mech mod is directly related to the actual output of the battery(s), meaning that the power output slopes downward as the battery drains. Mech mods have seen a huge surge in popularity lately, but they're definitely not for novices. A good understanding of battery safety and basic electrical principals will be necessary for you to safely operate a mechanical mod, and it's performance will depend soley on your choice of gear. Without any circuitry to regulate power or to protect the device, it's your responsibility to select the appropriate atomizers, coils and accessories to obtain optimal results. Understanding how these components work together IS VITAL. These days, mechanical mods are commonly used for "dripping" with rebuildable drip atomizers (RDAs), and sub-ohm vaping (the use of extremely low resistance heating coils) is a popular choice for experienced purists. Mechanical mods used in combination with RDAs can provide top-level performance, but they can also be extremely complex and dangerous if you don't know what you're doing. The choice between a regulated APV or a mechanical mod is dependent solely upon your personal preferences - and your level of experience. Unless you have someone to guide you along, I wouldn't recommend a mechanical e-cigarette mod unless you've had a decent amount of experience with a fully regulated device. With a regulated APV, you can learn all the basics without worrying about making any dangerous mistakes, and you'll also get a feel for the relationship between voltage, wattage and ohms. A full understanding of these core electrical principles (and all the different types of vaping gear) is vital to successfully operating a mechanical e-cigarette mod. If you're an experienced vaper with all the necessary skills and knowledge, the decision about which type of mod to choose boils down to your personality. If you want full control over your device and any of the components you attach, an advanced personal vaporizer will provide complete flexibility and do it in a safe manner. If you're a "hands-on" type of person and want top-level performance in a simple, rugged package, then a mech mod will probably suit you well. The choice is yours!